This cashel is prominently perched on top of a small rocky outcrop with commanding views of the surrounding countryside, just 375 metres north of Cahergal. 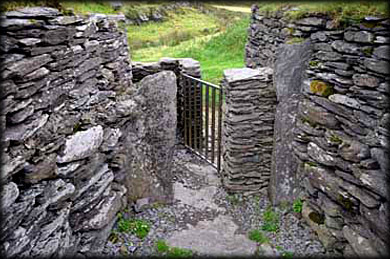 The name is derived from the Irish Leaca na Buaile meaning Slope of the Booley - Summer Cow Pasture. Follow the track around the northside of the outcrop to reach the entrance in the east wall, pictured above. 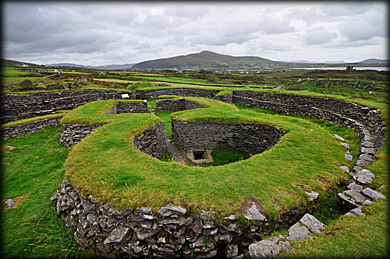 The 2.5 metre thick walls of this 9th/10th century fort have been reconstructed to a height of about 2 metres and above in places. 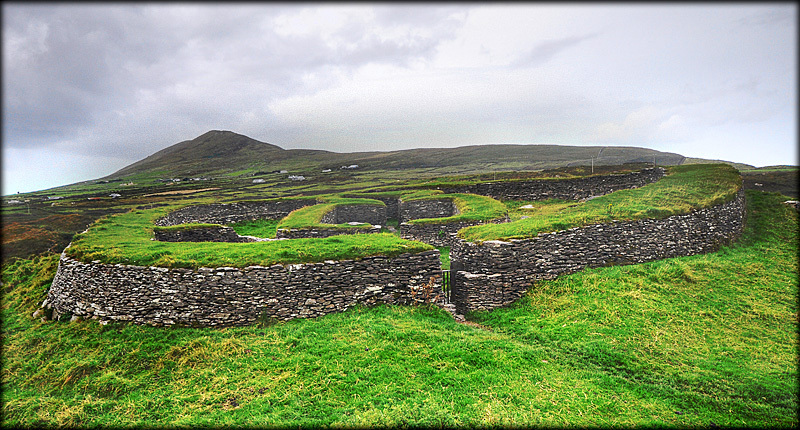 Inside the fort are the remains of four houses reconstructed to about the same height as the walls of the cashel. The oldest of these houses is a circular hut that abuts the west wall of the cashel. 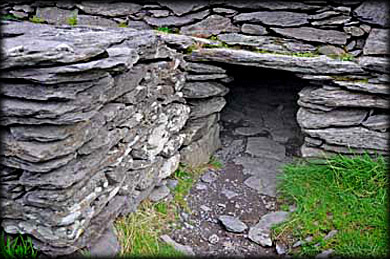 Inside the hut is the entrance to a souterrain that leads to a chamber in the west wall and four large post holes. These posts may have acted as supports for a timber roof. 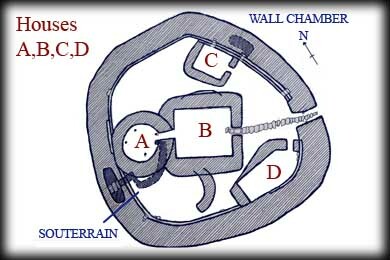 The largest rectangular hut, B in the diagram below, was added later, as was the two other huts C and D. There is another chamber in the east wall of the cashel. 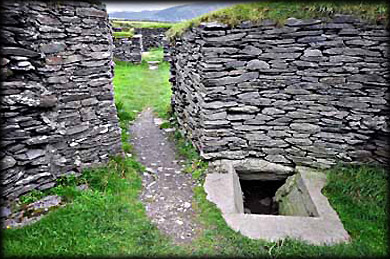 A covered drain runs from the rectangular hut to the forts entrance. Amongst the variety of finds during excavations inside the fort were Whetstones, Quern-stones, Mill-stones and some Iron knives. Situated: From Cahersiveen Community Centre turn onto Bridge Street. Signposted Stone Forts. After 800 metres turn left at the crossroads. Then 2 kilometres stop at small car park on the right. Go straight through the gate at the beginning of the track. 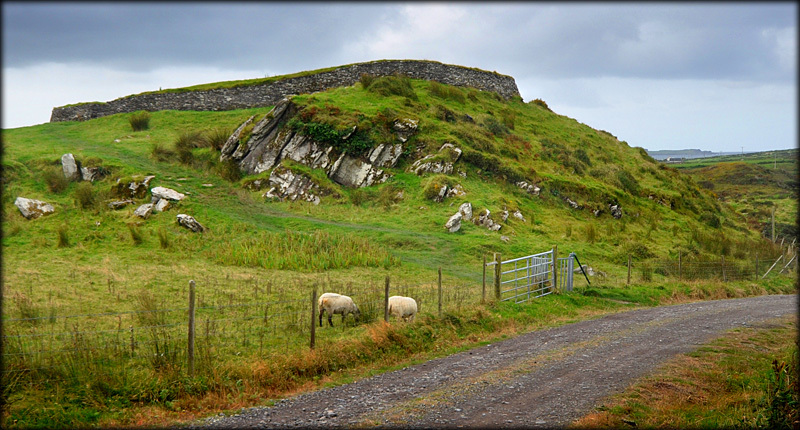 Cahergal stone fort is to the right. Discovery Map 83: V 4454 8086. Last visit Sept 2012.